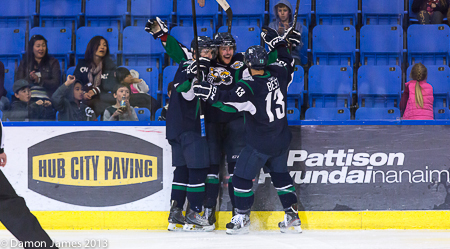 The Surrey Eagles will face the Brooks Bandits in the final of the Crescent Point Energy Western Canada Cup on Saturday night. The winner will book their ticket to Summerside, PEI and the Royal Bank Cup. The Bandits won the meeting between the two teams in the round robin by a score of 4-2. The Birds are looking to advance to the RBC for the first time since 1998 when head coach Matt Erhart played for the team. At the WCC Awards banquet on Friday evening, Eagles blue liner Devon Toews was named the MVP of the tournament, Michael Santaguida was named the top goaltender and forward Brady Shaw won the top scorer award. All three Surrey standouts were selected to the all-tournament team. Brooks is hoping to advance to its first ever RBC. The Bandits finished the round robin with a record of 3-1 and were ranked as the top team by virtue of the fact that they beat the Eagles in their head-to-head match-up. In the previous game between the two teams, Brooks' power play was effective against Surrey, going 2-for-3, and goaltender Michael Fredrick made 40 saves for the win. Forward RJ Reed was named to the all-tournament team.